Chef’s Log 36: All Thai-ed Up | The Spoon From Outer Space. Every now and then, you come across the dish of your dreams. It’s love at first bite. You see yourself spending the rest of your life with this dish- having kids, growing old together, living happily ever after. Of course, actually doing this is an offence that’s punishable by law on my planet. But never mind that. What matters is that I found the dish of my dreams at Café 23 in Calcutta- Spaghetti withThai flavours (with the pork option). What innovation, what brilliance, what a perfect harmony of flavours. Sigh. The spaghetti was soft, but not at all gooey; the pork was juicy and succulent and the sauce that held it all together was simply amazing- a powerful explosion of herbs and spices, with a subtle hint of ginger and a pungency that blows you off your feet without being overpowering. The Thai flavours were unmistakable. Who would have thought that two completely different kinds of cuisine would blend so well together? It was pure joy in every forkful. 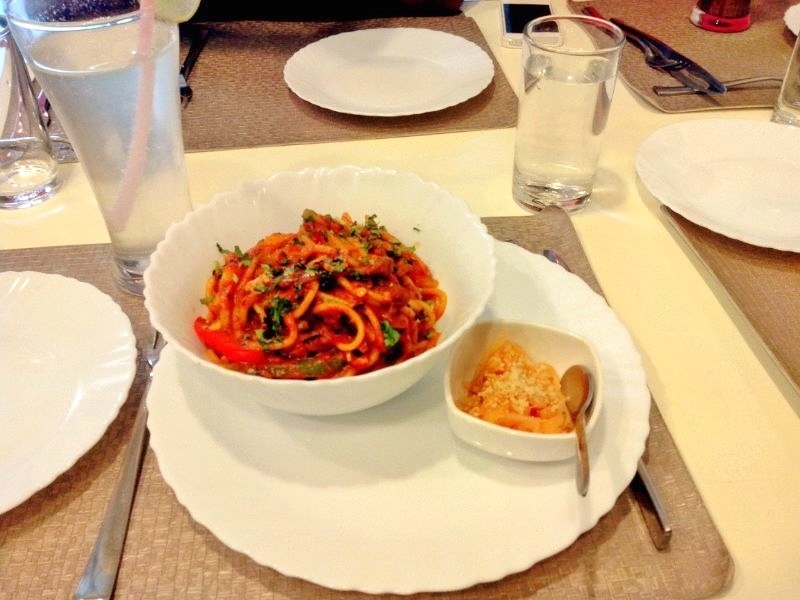 A papaya salad which was also delicious and wickedly spicy accompanied the spaghetti. This is what fusion cuisine should taste like. Take a bow, Café 23.